Drainage water management is a practice that has been around for years. When a farmer sees a drain tile running, even though it hasn’t rained for a month, he must ask himself, “Why?”. In the past, plugging the tile was an option. This was effective but problems could occur if the plug was not removed after a heavy rainfall. For over 35 years, Agri Drain Corporation has manufactured and supplied products for water management. These products have evolved, and today, are used for the implementation of drainage water management and subsurface irrigation. Water Level Control Structure for drainage water management. Agri Drain’s Water Level Control Structures are well known as a device used to manage the water table without plugging the tile. 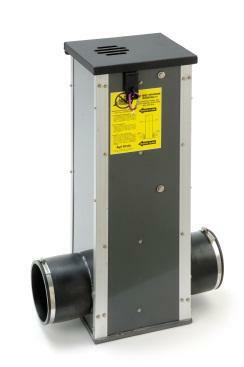 Agri Drain recently introduced the “Water Gate”, a float activated head pressure valve. The Water Gate is used in conjunction with a Water Level Control Structure, allowing drainage water management to be utilized on ground that may not have been viable in the past. Why Be Concerned About Subsurface Drainage and Water Quality? Agri Drain supports the practice of drainage water management as a way to improve water quality and potentially increase crop yields. Agri Drain is a member of Agricultural Drainage Management Coalition (ADMC). ADMC exists as a resource of the latest technologies in drainage water management systems. ADMC is committed to assisting the agricultural and environmental communities in improving water quality and increasing yields for food and energy producers. A five-state Conservation Innovation Grant (CIG) was secured by ADMC to demonstrate the effectiveness of drainage water management. Agri Drain supplied many of the products used in this demonstration. The results of this study can be viewed at www.admcoalition.com under the CIG Executive Summary. Agri Drain will continue to develop and improve existing products that help support the implementation of drainage water management.